Summer has flown by and the new school year is here. It’s time to start thinking about school lunches again. While some are ready to resume their school year routine, others are less than happy to be faced with the daunting task of packing lunches. After all, long work hours combined with various children’s activities can make it hard to prep dinner, let alone lunch for the following day. Often, this time crunch leaves parents throwing together whatever snack items they can find into a lunch box. Although this method is indeed time efficient, many of these lunches are heavy in simple carbohydrates and light in fiber, protein, and healthy fats. Here are some tips that will help make lunch prep easier for you this school year! Many of us use Pinterest for meal ideas, and a quick search of kid lunches will include glamorous meals that even adults would die for. The reality is, that most parents do not have the time to whip up these gourmet meals. We can do ourselves a favor by focusing on realistic meal ideas that are ideal for our family schedule and taste buds. 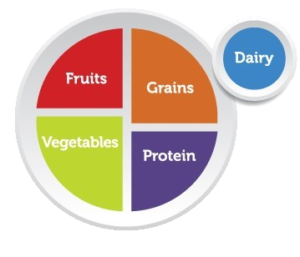 The MyPlate guide was designed to do just that-guide us through what our meal should look like. An is an excellent way to ensure meals are well-balanced. You can use the picture above to help account for all food groups, but keep in mind that the lunch doesn’t have to resemble this format 100%. For example, if you want to pack leftovers from the night before, your child’s lunch might consist of some whole grain pasta with diced chicken and mozzarella cheese. This meal would cover the grain, dairy, and protein components. Simply add some fruits and vegetables and you have successfully included all the MyPlate food components. The best part of this format is that it allows for creativity, but you can also, keep it as simple as you’d like by tossing in individual foods from each category, such as a mozzarella string cheese (dairy and some protein), a cup of mandarin oranges (fruit), pre-packaged carrot sticks (veggies), whole grain crackers (grains), and some sliced turkey (protein). The planning process doesn’t have to be elaborate– simply creating a 1-week menu or even a few days in advance will take the pressure off the morning of school. Start by creating a list of quick, go-to options that you will always have on hand, such as PB&J sandwiches on whole grain bread, whole grain crackers and cheese, and fruit and veggies. Then, be sure to always have your kitchen stocked with these healthy items so you have a backup plan if you find yourself in a bind. Glamorous or not, if children don’t like what’s in their lunch box, they aren’t going to eat it. Have your child sit down with you when you create the menu so they can give you their input. If they give you not-so-healthy suggestions, try giving those menu items a facelift by substituting healthier ingredients. For example, if they like pizza, instead of purchasing a pizza Lunchable or packing leftover frozen pizza, whip up a healthier option by topping a whole grain FlatOut Wrap (or similar product) with reduced sugar pizza sauce, mozzarella cheese, diced chicken, and veggies. This is a great alternative that includes 4 out the 5 MyPlate components and requires minimal prep. Every family is different, in what works for them. Some can prep an entire week worth of lunches on a Sunday night, and others only a few days in advanced. Find a routine that is realistic for you and your family, and try your best to stick with it. Purchase snack items (such as whole grain crackers, nuts, and air popped popcorn) in bulk and pre-portion them out in snack bags. Store these items in labeled containers in the pantry for grab and go options. Make several sandwiches at once and store them in a special section of your fridge. This will save you time from having to prep one every morning/night since you will already have all the ingredients out. However, stick to prepping out 2-3 sandwiches at a time because the bread can get soggy. Now that you have a better idea of how to prep and pack a lunch like a pro, it’s time to put on your thinking cap for healthy lunch ideas. Again, these don’t have to be elaborate; a simple lunch with healthy food components will suffice. Below are some suggestions for some healthy lunches for busy parents! Breakfast Wraps: Spread natural peanut butter with no added sugar on a whole grain tortilla or wrap. Top with fresh fruit, such as strawberries and bananas. Roll up and slice in half. Provides grain, fruit, and protein components. Pair with veggie sticks and yogurt for a complete meal. Mexican Chicken Pita: Stuff a whole grain pita with diced chicken, avocado slices, lettuce, shredded cheese, and salsa. Serve with a mozzarella string cheese and orange slices for a complete meal. Cream Cheese and Veggie Sandwich: Top whole grain bread or a whole grain English muffin with reduced fat cream cheese, cucumber slices, and bell peppers. Add a serving of fruit for a complete meal. Yogurt Parfait: Layer plain Greek yogurt with layers of fresh fruit, such as berries, bananas, or peaches. Pack a side of crunchy, whole grain cereal as a nice topping and some fresh veggie sticks with hummus for a well-balanced meal. Hummus Pita: Spread 2 tablespoons of hummus inside a whole grain pita and stuff with baby spinach leaves, cucumbers, and bell peppers. Serve with a small piece of fruit and hard boiled egg. Bento Box: Pair sliced apples with no sugar added nut butter, cubed cheese, veggie sticks plus hummus, and whole grain crackers. Blend the following ingredients together until smooth. Makes 2 servings.